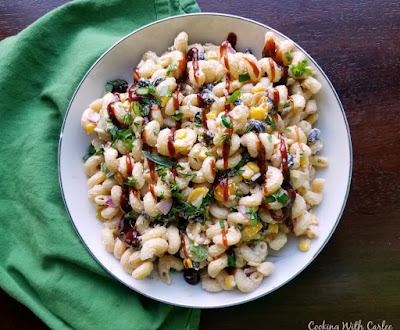 This pasta salad has it all, BBQ, ranch, tomatoes, avocados, corn and more! It's perfect for picnics, BBQs, potlucks and more! Summer is definitely in full swing around here! The heat and humidity are up, sure, but that's not what I'm talking about. Nope, I'm talking about BBQs and picnics! Summer just begs for a few of each. Maybe I should change that to quite a few in our case! Whether that means spreading a blanket under the tree in the backyard to eat a sandwich and piece of fruit or something more sophisticated that requires a basket and some travel, it is all fun! I batted around the idea of putting together a fun sandwich or wrap, but couldn't find the inspiration for something fun and new. In reality, I basically never eat sandwiches unless it's the occasional grilled cheese and those aren't very picnicy. My husband eats sandwiches almost every day, by I wouldn't consider his ham, cheese, mustard and mayo on white bread very earth-shattering! So I moved on to what I've been really loving lately, a picnic salad! I have definitely had a thing for them these past couple of years. For a little while I made a bunch of quinoa salads, caprese, fall fruit, strawberries, and cherries. Of course I love our deviled egg potato salad and recently I've been into barley salads. Both the asparagus version and the Mexican street corn version are amazing! But this week I was in the mood for a delicious pasta salad. It is amazing how many ways you can switch up a salad like this. There's the simple and classic versions with Italian dressing, creamier mayo based versions and fun twists like BLT pasta salad. But this time I thought I'd use some of our favorite classic summer flavors. That's right, BBQ, ranch, tomatoes and corn. Doesn't that sound like summer already? I made ours as a side dish, but you could add some chicken and make it the whole meal if you'd like. Take a big bowl to a potluck and watch it disappear or spoon it into jars as an easy carry along to a picnic. You can use ranch seasoning from a packet or make your own seasoning mix and adjust the amount to your flavor preferences. I wanted it to have a noticeable ranch flavor without it kicking you in the face, you may choose to add a little more depending on your taste. While this salad is the prettiest and freshest the first day, it does keep rather well. We ate it as a side dish on Sunday and then I brought some to work for lunch the next several days along with some greens. A few days in the avocados start to oxidize, but it still tastes great! So break out your pick-i-nick baskets and throw together this salad. You might as well head out and soak in some of this sunshine! This pasta salad is perfect for summer! It is full of flavor and will be your new favorite. Take it to potlucks, BBQs, picnics and more! Stir together ranch seasoning, sour cream and BBQ sauce in a large bowl. Add cooked, drained and cooled pasta. Stir to coat. Add cheese and chopped vegetables except for the avocado. Refrigerate until ready to serve. When you are ready to serve, dice avocado and stir into pasta salad. Garnish with additional BBQ sauce and fresh herbs if desired. Oh yum, Carlee! I bet this would really hit the spot on a hot day. There's something so satisfying about a pasta salad and I'm always looking for a good potluck/party/barbecue dish! Especially if it's something new and fun that not everyone has had! It is hard to come up with the perfect dish that travels well, is familiar enough that people will try it but different enough that it's not the same-old same-old. You wouldn't think it would be such a challenge! Thanks so much, Molly! This loaded pasta salad sounds amazing!!! 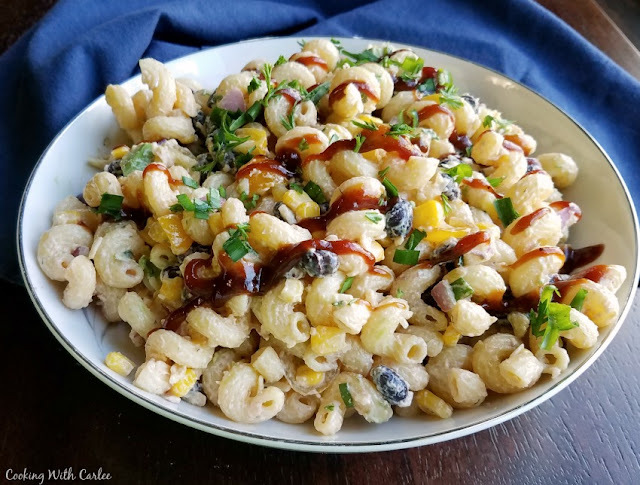 The barbecue sauce in this pasta salad sounds intriguing. I have to admit that I have never tried that before. I will see have to see how my family likes that. Thank you for sharing. It adds that little bit of zip and interest. We really thought it was good in there, I hope your family does too! This sounds amazing! My hubby loves anything BBQ! He will love it! I never liked BBQ sauce growing up, but now I can't get enough! I hope your hubby enjoys it! This sounds really good! 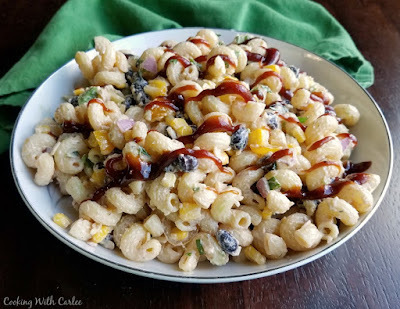 I love pasta salad and a BBQ Ranch version sounds super tasty! Love all of these flavors, especially mixing together BBQ and ranch! Genius! I admit I'm not a huge fan of pasta salads myself, but they are great for taking on a picnic or to a potluck. My husband really isn't a pasta salad fan either. He usually will suffer through it once and I'll stir in some extra veggies or beans and take it for lunch until it's gone. He actually volunteered to eat this one a second time later in the week! I love the Ranch flavor for your awesome Pasta Salad! I sure appreciate you sharing with us at Full Plate Thursday. Have a great week and come back soon! Yes please! I've been on a real kick lately with BBQ sauce, so I need to try this. This could be the pasta salad to rock my summer! I never used to like BBQ sauce, but now it is a staple! I hope you love it!